February 2019 Newsletter -- Energy Matters, LLC. Unlock Your Greatest Potential in 2019! When 2019 arrived at the start of January, many of us took time to reflect on our lives and decide what aspects we would like to change. Resolutions are a popular tradition, and yet it's common knowledge that very few are actually successful. This year, Energy Matters, LLC. has committed to identifying what prevents people from achieving their deepest desires. And we've developed solutions you can use to finally unlock your greatest potential in 2019. You really deserve a healthy, amazing life! In this newsletter you'll learn one unique place where emotions are stored and why tearscan be a sign of healing. Discover advances in Infrared Therapy and find out what could bepreventing you from losing weight. Plus, take a peek at the first two parts of Energy Matters, LLC's exclusive 2019 Intentions Series. Use this collective knowledge to improve your energy, your health, and your ability to accomplish all you desire. P.S. Follow Energy Matters, LLC on Facebook, Twitter or Instagram for more tips. 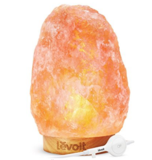 Lamps made from natural pink Himalayan Salt remove positive ions from the air, cleansing your space and allowing more beneficial negative ions to do their work..